Tell Your Maine Legislators to Reject General Dynamics' Request for $60 Million. General Dynamics (which owns Bath Iron Works) is embarking on a statewide public relations campaign to ask the state legislature in Maine for a $60 million tax break over the next 20 years for its operation in Bath. Click here to email your Maine legislators to say No! Already over many years General Dynamics has received more than $200 million in state and local tax breaks for BIW. In 2013 General Dynamics asked for another $6 million tax break from the City of Bath, but a local campaign persuaded the city council to reduce that to $3 million. Now General Dynamics is back to ask an already financially strapped state of Maine for an additional $60 million. How badly does General Dynamics need the money? Not at all! 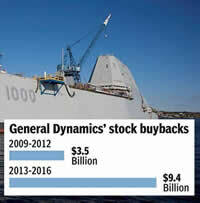 General Dynamics spent $9.4 billion between 2013 and 2016 buying back its own stocks. William Lazonick, an economist at UMASS-Lowell and an expert on stock buybacks says, "I think, as taxpayers, we're being taken for fools. At a minimum, I would have a rule saying, 'You're not getting any subsidies if you're doing buybacks. You're showing us you don't need the money.'" General Dynamics last year paid CEO Phebe Novakovic $21 million. Click here to easily email your Maine legislators to tell them what you'd like your money spent on instead of more riches for a mega-wealthy weapons corporation you're already funding with federal taxes. Before General Dynamics gets any more state taxpayer dollars it should be required to begin a transition process to build commuter rail systems, tidal power and offshore wind turbines to help us deal with our real problem - global warming. We have the right, and the responsibility, to speak out and demand this nonsense stops now. We are handing a collapsing nation, facing the ravages of global warming, to our children and grandchildren. The least we can do is call upon on state legislators to go to Augusta and say no to General Dynamics. Enough is enough. Let General Dynamics take back some of the extravagant pay increases and bonuses from its top executives before it comes poor-mouthing to our already financially barren state treasury. After emailing your Maine legislators, please use the tools on the next webpage to share it with your friends in Maine. 6. It is an extremely dangerous situation. It is really up to the United States to take the first step down the Ladder of Escalation that it has constructed here. 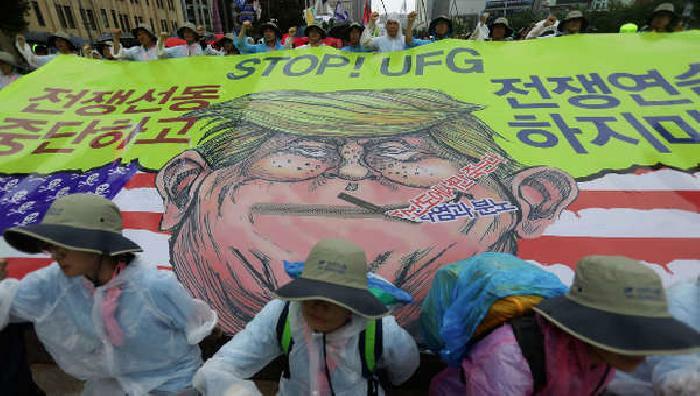 Instead it appears that the Trump administration is going to escalate up the Ladder of Escalation in the hope and expectation that DPRK will capitulate. This is what International Political Scientists call a Game of Chicken -- with cosmic consequences. Who will blink first? Anything can go wrong. Thank you so much for being here today to prevent World War III. 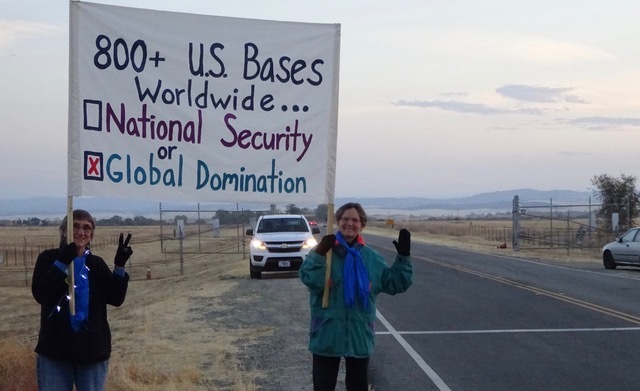 Activists outside Beale AFB in northern California hold banner where recon drones, U-2 spy planes and 'missile defense' radar are stationed. 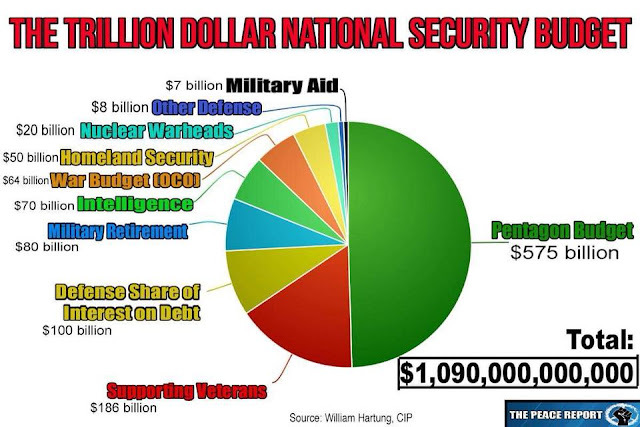 The US military empire is costing our nation and arm and a leg and is a direct reason why social progress and our physical infrastructure are being dismantled. A National Conference on U.S. Foreign Military Bases on January 12-14, 2018 will be held at the Learning Commons Town Hall, University of Baltimore (1415 Maryland Avenue) in Maryland. Excellent video produced by Will Griffin (Veterans For Peace) about GD/BIW request for more corporate welfare from state of Maine. Snipers sent to Kiev in 2014 from Republic of Georgia which at the time was run by a total US puppet Mikheil Saakashvili. Likely he was under orders from the CIA to send the snipers to help create chaos in Ukraine which is exactly what happened. Now the snipers have confessed. Saakashvili was eventually run out of Georgia by the people and today he is in Ukraine stirring up trouble there. 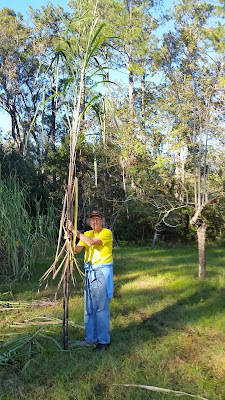 On Friday MB and I arrived in Jacksonville, Florida and went to the Geiger farm which sits very near the airport off Hwy 295. 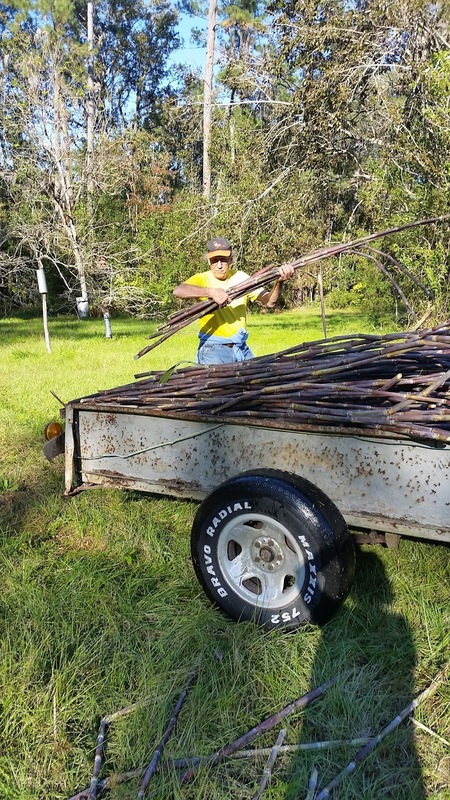 We quickly found ourselves loading sugar can stalks into the trailer behind Al Geiger's old tractor. 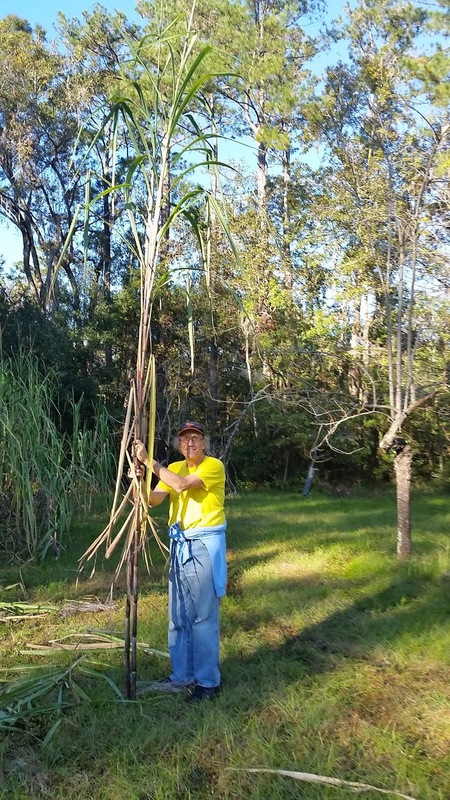 Al, now 87 years old, and his son Danny were cutting the cane in preparation for Saturday's cane syrup making. Quite a bunch of people showed up on Saturday to help with the cane squeezing and boiling process that is outlined in great detail in the video below shot a few years ago at the Geiger farm. Then late Saturday afternoon MB and I drove to Gainvesville (about 90 minutes away) to meet friends Julie Netzer and Miriam Elliott for supper at a favorite BBQ joint. MB and I lived in Gainesville for many years before moving to Maine in 2003. Today MB, Miriam, Julie and I met John and Martina Linnehan for lunch in Gainesville. All of these folks were deeply involved in the Florida Coalition for Peace & Justice which I coordinated for 15 years. So we had a wonderful visit. We are staying at the home of Bill and Sally Warrick in Gainesville. Bill is a Veterans For Peace member and was my medical doctor during the 10 years I lived in town. So it is also a lovely reunion with them as well. Tomorrow we are driving to the Atlantic Coast city of St Augustine (the oldest city in America) where we will have a visit with Yosi McIntire who is like a brother to me. His mom Peg McIntire was the heart and soul of the Florida Coalition during our prime years. She lived to about 98 years old and stayed active to the end. What a trip it has been so far. Much more excitement to come.